In other words, the Second Amendment is even more vulnerable to abuse than the First. The dovetailing IRS, AP and Fox News scandals expose the shockingly routine contempt that federal bureaucrats show toward Americans’ Constitutional rights. By what logic then, applying each day’s new revelations, would we choose to grant even more government discretion over those rights? When it comes to the Second Amendment, the answer should be obvious. No other right receives as much scorn and disdain as the right to keep and bear arms. After all, even the most hardened, dead-end leftists will profess cursory respect for First Amendment freedoms, at least publicly. Behind closed doors, of course, we now know the reality is altogether different. The Second Amendment, in contrast, is regularly labeled a dangerous 18th century anachronism, one that ideally should be repealed. Whereas First Amendment abuse is generally concealed, hostility toward the Second Amendment is openly announced. 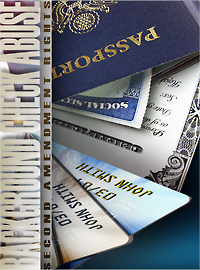 Which raises the issue of background check legislation, which proponents have vowed to revive. Just one month ago, Barack Obama and gun control advocates labeled Congressional rejection of the Schumer-Toomey-Manchin bill “shameful.” Sanctimoniously exploiting the parents of Newtown shooting victims, he and they pretended that the proposed legislation did nothing more than modestly increase background checks for firearms purchases. With public opinion polls showing broad generic support for the vague proposition, they assumed Congressional approval to be a slam-dunk, something for Obama to add to his tiny collection of achievements as President. What the doomed legislation proposed, however, was very different. First, the bill would have required the keeping of purchase records. After that, a future federal gun registry would be far closer to reality. Given what we now know about rogue federal agents and their fishing expeditions, that is simply an unacceptable risk. Second, it was false for advocates to claim that the legislation in no way constituted “gun control.” By definition, a background check presumes criteria to limit which Americans can and cannot legally purchase or possess a firearm. In turn, those criteria must be set by federal authorities. And when those bureaucrats can massage the lines separating who can and cannot own a gun, the potential for abuse becomes immediate. To cite just one example, what happens when even the slightest symptoms of post-traumatic stress disorder (PTSD), even temporary, becomes a basis for exclusion? Innumerable current and former members of our armed services, battered spouses, accident victims and others would suddenly become ineligible. If that sounds far-fetched, so did outright IRS targeting of conservatives simply for being conservatives just two weeks ago. So did the possibility of Justice Department persecution of disfavored media groups and news reporters. Now we know better. The failed bill also undermined existing mental health record privacy protections, which again should trouble Americans in light of recent scandals. Accordingly, the allegedly innocuous and unobjectionable “background check” bill would open numerous new avenues for intrusion and abuse. In light of each passing day’s revelations regarding First Amendment violations by government officials in the IRS, AP and Fox News scandals, we simply cannot open the door to greater Second Amendment abuse by the same government. If there is a silver lining to the scandals blossoming across so many arms of our federal government, it is a healthier wariness toward government overreach and tyranny. President Obama may find that distasteful, but our Constitutional rights will be more secure as a result.